Any pancake lovers out there? 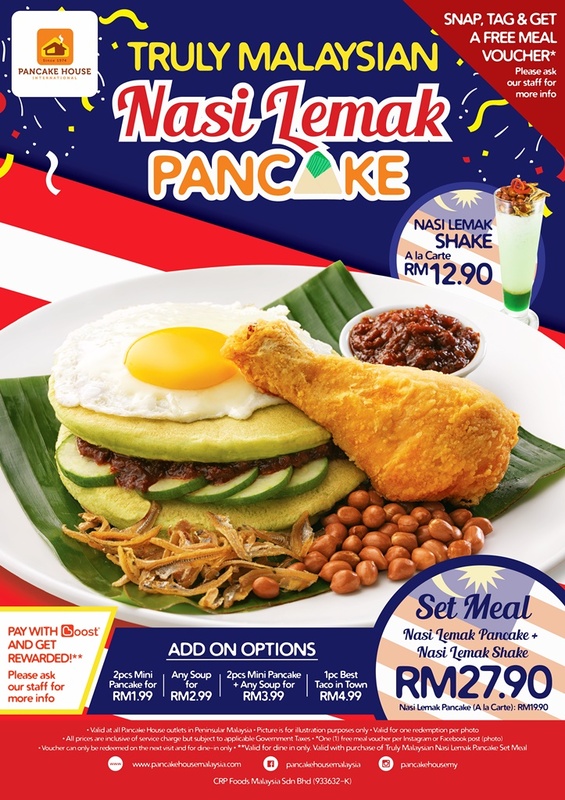 Well, Pancake House Malaysia, the famous pancake restaurant in Klang Valley is excited to offer a delicious version of nasi lemak ~ 'Truly Malaysian Nasi Lemak Pancake' in conjunction with the celebration of Merdeka Day and Malaysia Day for this year. Since they are synonymous with serving amazingly tasty light and fluffy pancake, their version of nasi lemak comes with two slices of pandan-flavoured pancakes instead of coconut milk (santan) rice, sandwiched in between spicy sambal and sliced cucumbers. Oh did I mentioned that the nasi lemak pancake comes with two portions of air-fried chicken? It was indeed a generous serving of two well-marinated 'air-fried chicken' coated in the crispy coating but not oily at all. Served with fried chicken, sunny side up, fried ikan bilis, peanuts with pandan-flavoured pancakes, they aced in the good-tasting sambal that goes well with the savoury pancakes! Diners can now order the Nasi Lemak Pancake Set Meal which comes with a special drink of 'Nasi Lemak Shake' for RM 27.90 only. Alternatively, the ala carte Nasi Lemak Pancake is priced RM 19.90. The 'Nasi Lemak Shake' is a great accompaniment to the Nasi Lemak Pancake for its rich and creamy flavour made from a concoction of pure coconut milk with its flavour enhanced with spicy cayenne and savoury deep-fried ikan bilis. Nasi lemak lovers will definitely enjoy the sweet and fragrant pandan syrup added to the drink topped with crispy ikan bilis and peanuts for the extra kick! 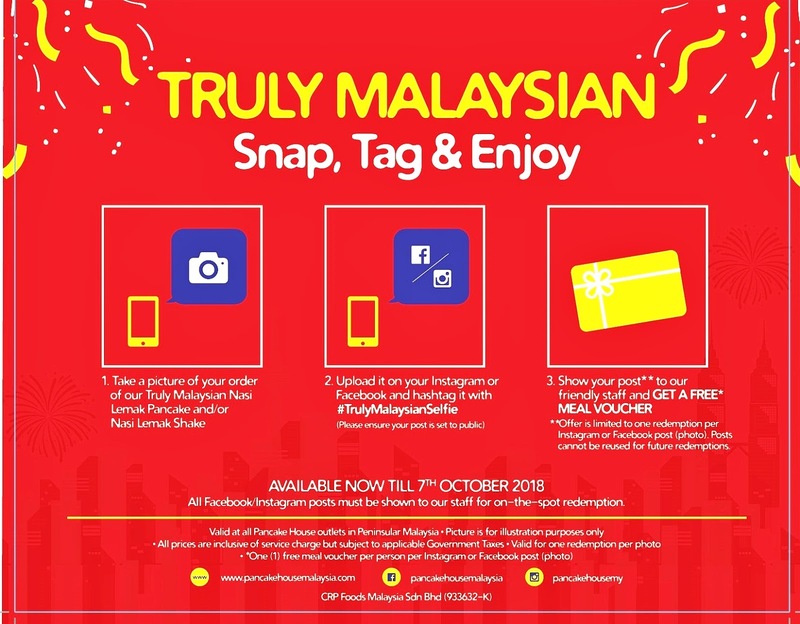 During this joyful Merdeka period from NOW TILL 7th OCTOBER 2018, Pancake House is giving out a FREE MEAL VOUCHER to diners who post pictures (set to public) on their Instagram or Facebook of the 'Truly Malaysian Nasi Lemak Pancake' and/or 'Nasi Lemak Shake' with hashtag #TrulyMalaysianSelfie. 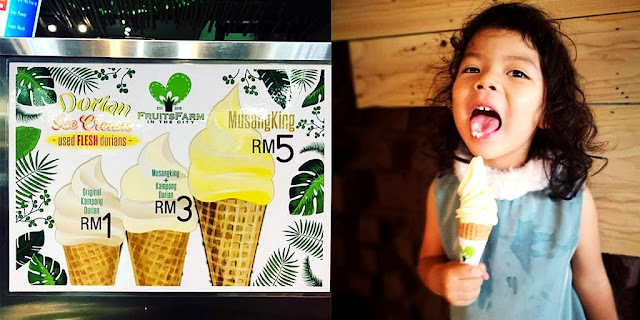 As easy as ABC, just post the picture to your social media channels and show your public post with the hashtag #TrulyMalaysianSelfie to Pancake House friendly staff to redeem yourself a FREE MEAL VOUCHER. Offer is limited to one redemption per Instagram or Facebook post (photo) and posts cannot be reused for future redemptions. Available NOW TILL 7th OCTOBER 2018! Hurry come to Pancake House to check out their latest Nasi Lemak Pancake Promotion and redeem your FREE MEAL VOUCHER too. During my dining experience, I also ordered a new pasta dish for my pasta-loving son to try out. 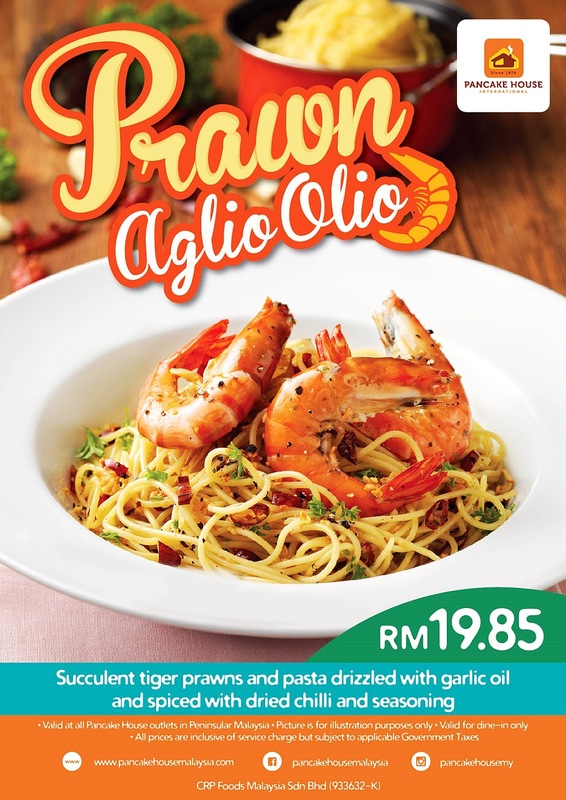 Pancake House's new addition of Prawn Aglio Olio features spaghetti with pan-fried succulent tiger prawns drizzled with fragrant garlic oil and spiced with dried chilli and homemade seasoning. Prawn Aglio Olio was indeed a well-flavoured pasta dish - simple but fragrant with garlic oil coating every single strand of the spaghetti. The tiger prawns were fresh and juicy, not overcooked and go well with the pasta. For me, I find it to be a bit too spicy for my taste buds. So if you are not into really spicy dishes like me, maybe you can request them to go low on the chillies.